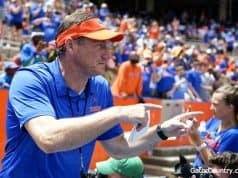 Florida ran into one of the best defenses in the country and couldn’t match that challenge on Saturday night falling to the Michigan Wolverines 64-49, ending the Gators’ season in the Round of 32 in blowout fashion. Michigan’s outstanding work at defending the screen and roll bottled up a lot of Florida’s offense and though 50% shooting from three-point land in the first half kept the Gators in it that number was destined to come back to earth and when it did the Wolverines burst out in a lead the Gators were unable to catch. Zavier Simpson lead the way for Michigan and flirted with a triple-double logging 9 points, 9 assists, and 9 rebounds while Andrew Nembhard had some great moments with 7 points, 8 assists, and 3 steals. 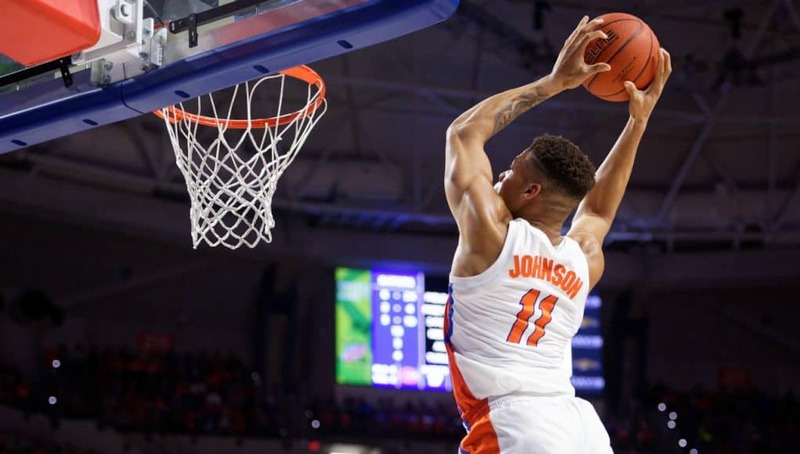 Only shooting 34% from the field the Gators were in a world of hurt trying to put the ball in the basket against one of the best defenses in the country and only putting up 49 points was ultimately the reason they were eliminated from the NCAA Tournament. A lot of that has to do with how good Michigan’s defense is but there was also a lot of indecision and some serious lacking of execution by the Gators with the ball. 9 of their 19 field goals was from three and while that’s a solid number from deep it shows just how much trouble they had scoring inside. Finishing on the interior has been a struggle all year and it definitely bit them tonight. 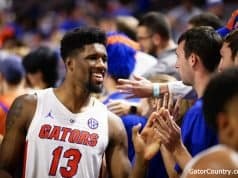 For the Gators to have reached their potential ceiling this year they would have needed solid production from their seniors and it didn’t happen tonight. Jalen Hudson went 4 for 15 from the field (27%) and KeVaughn Allen was 3 for 7 on a quiet night that saw him scoreless for most of the game. Kevarrius Hayes had some really great moment on the defensive end and even had some good finishes but also came up empty on the first two possessions of the game where he had chances on the inside that would have set the tone moving forward. It was a frustrating year for Hudson and Allen and unfortunately they’ll be going out on a sour note. Florida’s trio of freshmen Andrew Nembhard (7 points, 8 assists), Keyontae Johnson (7 points, 9 rebounds), and Noah Locke (8 points) all took some licks tonight but also had some really good moments that showed how bright the future is for the Gators. Nembhard’s ability to get 8 assists against a stout defense showed how truly elite his vision is and though Keyontae Johnson missed some shots on the inside he usually makes he also competed on the glass and had some good moments on the defensive end. Locke was able to hit two threes despite being hobbled by an injury which was a great reminder of the fact that when he’s healthy he is an elite shooter. They competed their hearts out tonight and I can’t wait to see them play again next season. Michigan has a complex and potent offense but the Gators showed a lack of discipline that hurt them tonight. Some missed rotations led to open threes and some unnecessary switches allowed 7’1” Jon Teske to go to work against some guards. Perhaps what sums up some of the lapses in discipline the best was the fact Florida fouled 3-point shooters on three separate occasions with one of them being a 4-point play. Fouling a 3-point shooter is usually due to a lazy closeout and those three fouls may have been an indication of the level of focus at times. Michigan is really good. 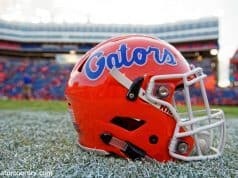 I laid that out during my scouting articles and it was confirmed by the way they played against the Gators. I don’t think Florida played their basketball and still was in the game for a decent chunk of it but ultimately the team with that executed better and got far more from their seniors was victorious. It just wasn’t meant to be for the Gators this year but I thought the play of the younger players was extremely encouraging and the experience they had in these big games through the SEC and NCAA Tournament could be extremely valuable next season and beyond.